The Economic Times Real Estate and Digital Marketing Summit New Delhi – 27th June, 2014. The Economic Times has offered me an opportunity to speak on the topic "How Technology Can Take Real Estate Marketing to the Next Level?" 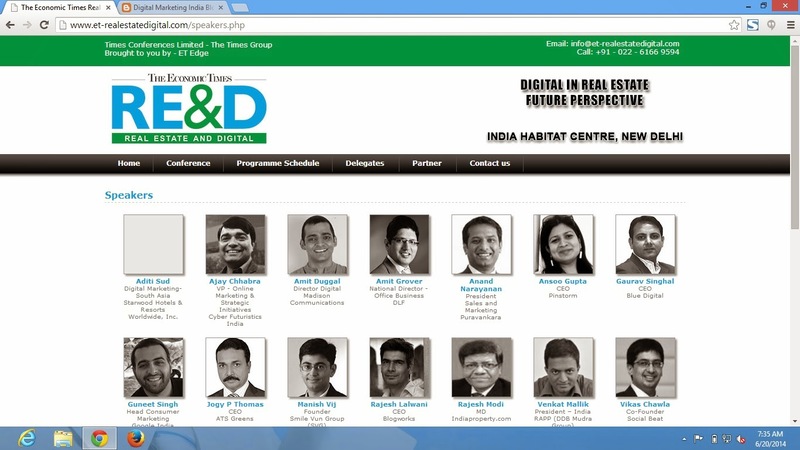 In The ET Edge - Real Estate & Digital Marketing Summit on 27th June 2014 in New Delhi. This is going to be an interesting forum for the Real Estate Industry CEOs as at this juncture they are facing the challenge of slowdown, traditional marketing is often not delivering the desired outcomes, customer demographics are changing and beyond digital first, mobile first is a new trend in Real Estate Search. However Digital Marketing is still a mere 25% of the total INR 2500 Cr. estimated spends in the Real Estate marketing. There is a great potential and opportunity for the digital marketing professionals to help grow the Real Estate Industry in India and I have almost finished my presentation on "How Technology Can Take Real Estate Marketing to the Next Level?". This is gonna be a little futuristic presentation but I am very confident that this is going to be a delight for all Real Estate Decision makers. Looking forward to this big day on 27th June, 2014. My sincere thanks to The Economic Times Edge Events Team in advance. Click to see the details about other Speakers for ET Real Estate and Digital Marketing, New Delhi. Thanks Mr.Ajay for sharing such an informative article. I experience the return of Digital marketing in real estate sector by getting good response for the property.